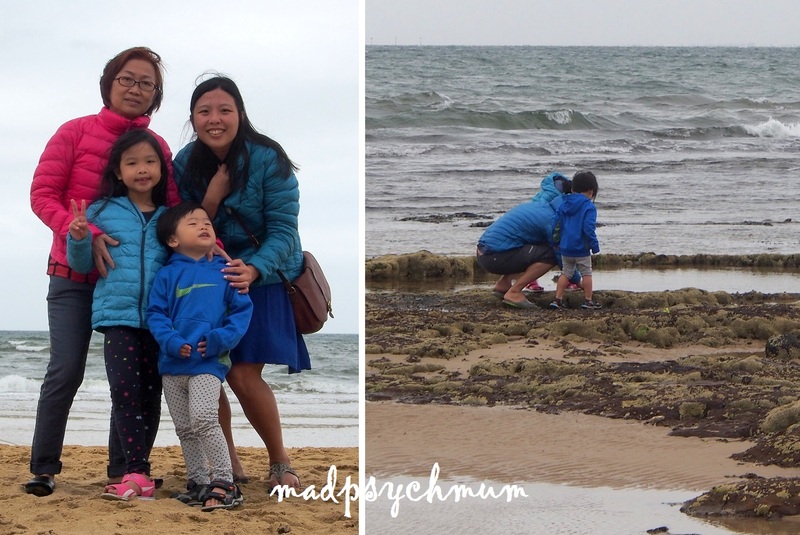 We had originally intended to go straight to Brighton Beach but as we overshot the carpark, we stumbled onto Green Point Brighton by accident. We drove back to the correct carpark and parked our car. 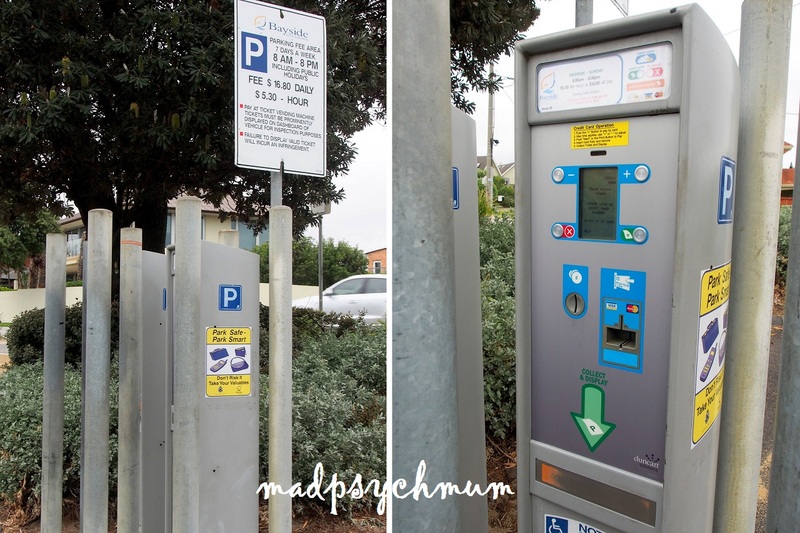 Pay your parking fee at one of these machines. Do ensure that you have coins with you as not every machine allows you to use notes or card. The highlight of Brighton Beach was the Brighton Bathing Boxes. 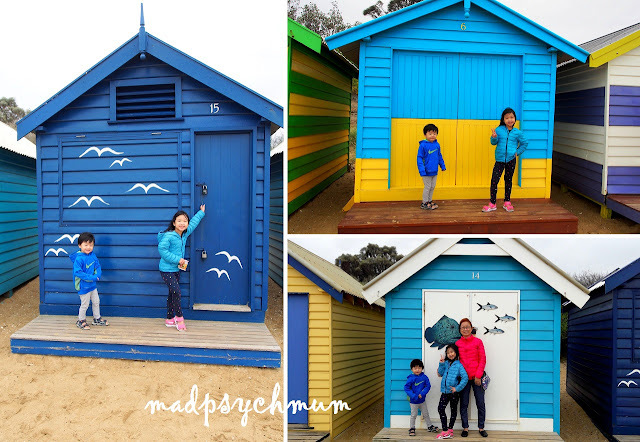 Love the bright and colourful huts!! 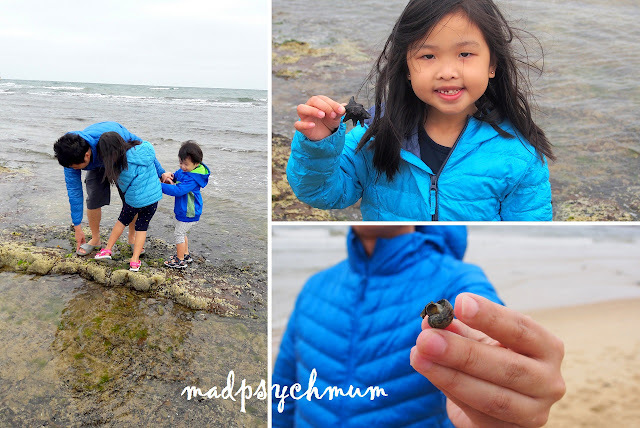 The weather was perfect for exploring the beach, which the kids enjoyed doing with their daddy (this is what fathers are for I suppose because this mummy would rather keep her feet nice and dry on the beach *laughs*). Having fun at Brighton Beach! 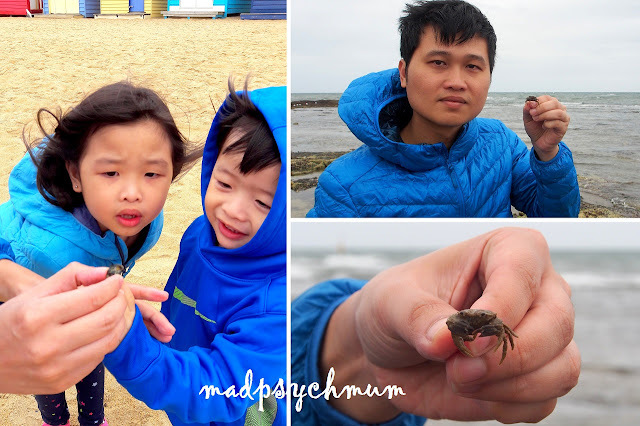 Hubby found a tiny crab! 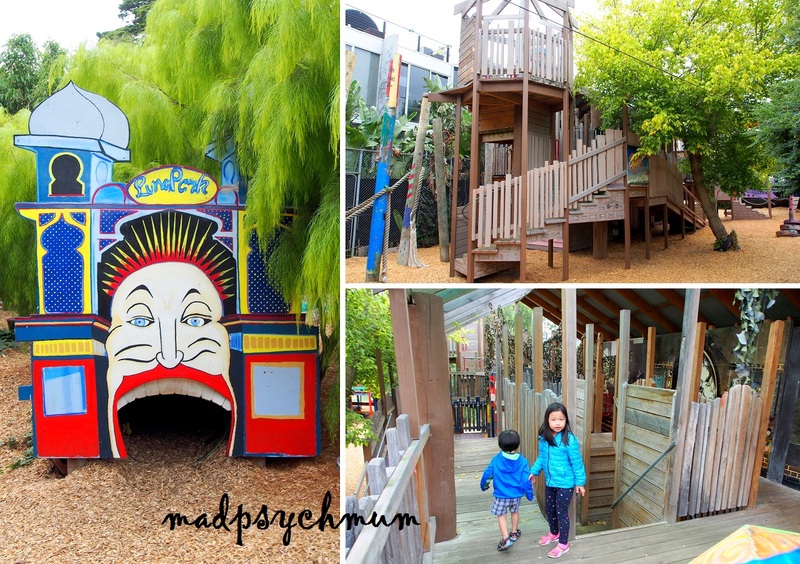 We drove off towards St Kilda and passed a nice playground along the way where we decided to have our lunch. 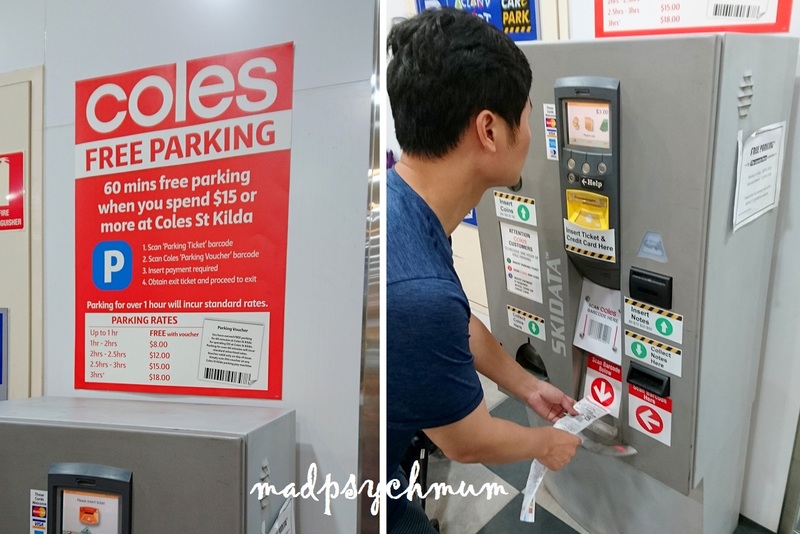 The parking system was similar to Sydney (read my previous post for tips on reading the parking signboard). The parking is not free but technically we didn't have to pay as we could watch our car from the bench at the playground. We paid anyway because we're too honest *laughs*. We were supposed to go to St Kilda Adventure Playground after lunch but it was not opened yet (only opened at 3.30pm on weekdays). To kill time, we popped by the nearest mall, Acland Court Shopping Centre, to do some shopping. When it was 3.15pm, we drove to St Kilda Adventure Playground. 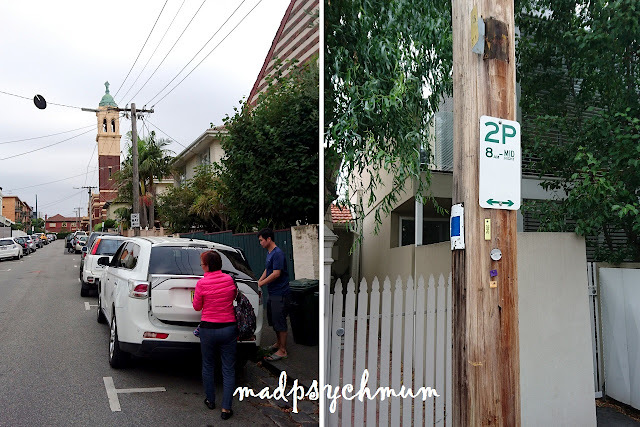 After going around the park in circles looking for the perfect parking spot, we found that the best place to park is along Neptune Street. Parking is FREE but be sure not to park more than 2 hours because they do issue you with a fine if you do. We saw a lot of cars with parking tickets when we left but don't ask me how they know that you have exceeded the 2 hours (I have no idea either). Right: Look out for this signboard, which means you can park for free for 2 hours within the stipulated time. Please remember to check the opening hours before going as it might be different. When we went, the opening hours were 3.30pm to 6pm on weekdays and 12 noon to 4pm on weekends and Public Holidays. 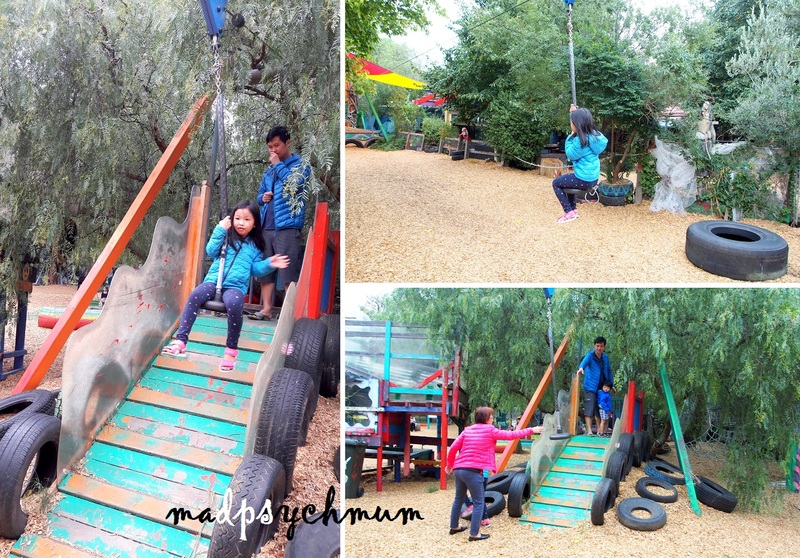 A treehouse greeted us as we entered the playground! The playground is big on imagination and bringing the child back to nature by using very organic materials such as tires, wood and metal. 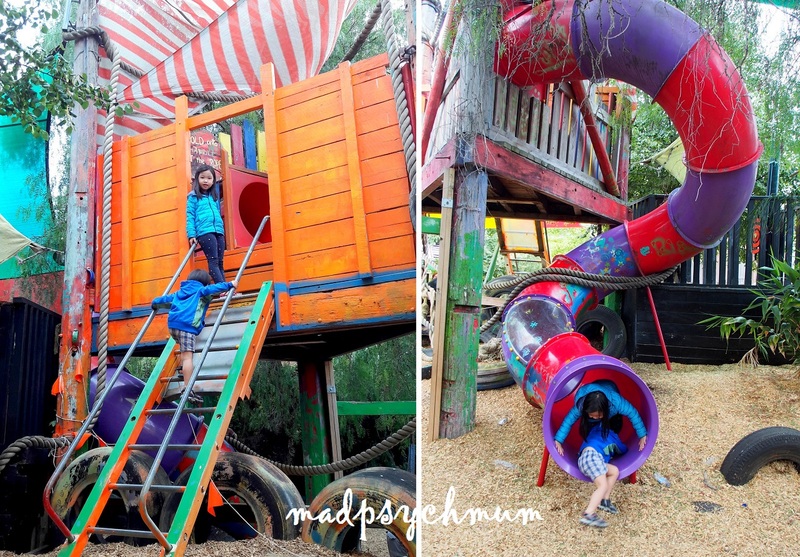 It was a very unique playground where my girl had a lot of fun! The kids didn't want to leave for dinner even though the stomachs of the rest of us were growling so much. 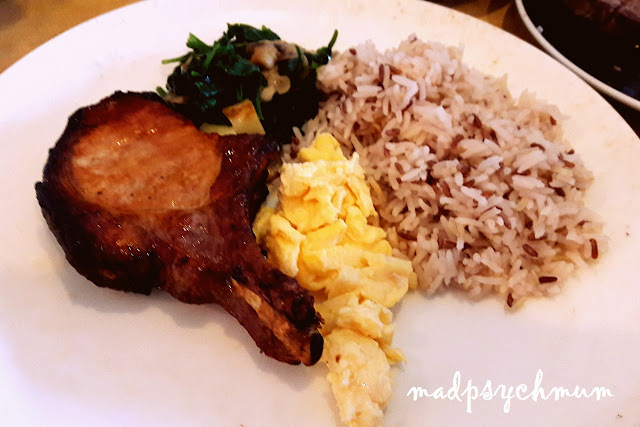 The hubby and mum-in-law preferred to eat home-cooked food so we travelled back to our apartment. 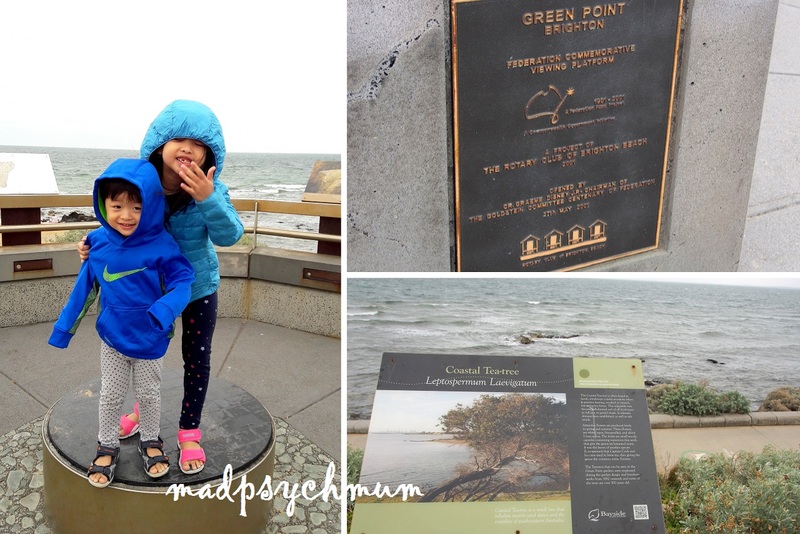 After dinner, we drove back to St Kilda Pier to see the St Kilda Little Penguins at the St Kilda Breakwater. These penguins belong to the St Kilda Protected Little Penguin Colony and are the same species as the penguins at Philip Island. Welcome to St Kilda Pier! Please remember that you MUST NOT use your flash at all times! Not only is it illegal, the flash harms the eyes of the penguins. Only red light is permitted as they are less sensitive to red light. 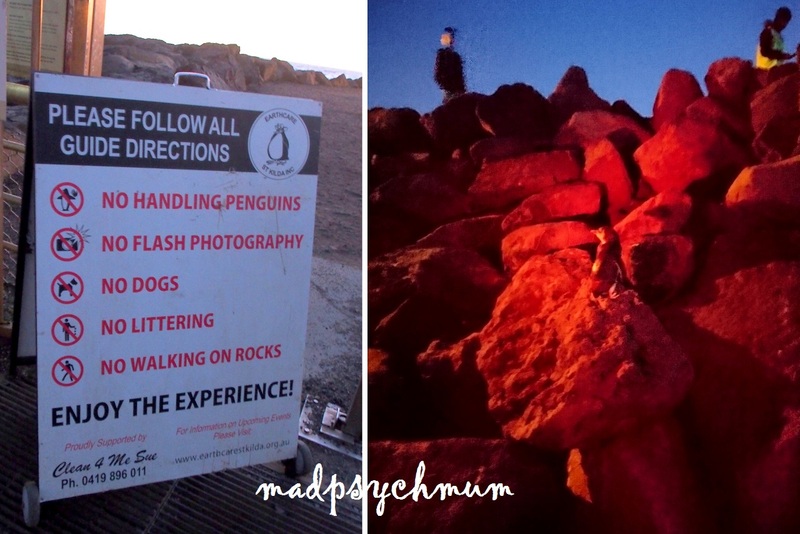 Not to worry about capturing the best photo: volunteers are stationed around the breakwater with red touchlights so that you can still capture the moment without harming the penguins. We were soooo close! What an honour to see them in their native environment! When it got more crowded, we decided to leave and head to Luna Park Melbourne. 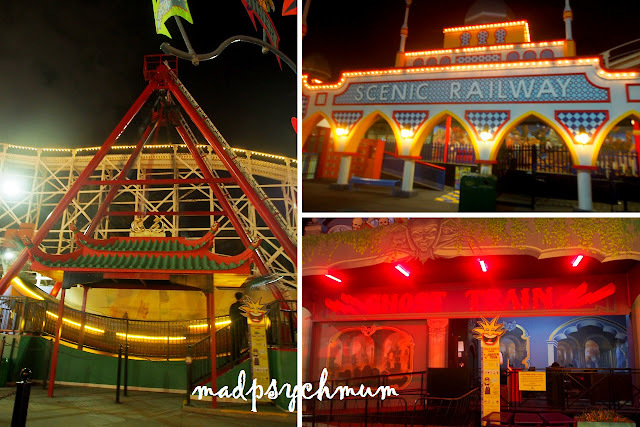 Similar to the Luna Park that we visited in Sydney, the park had its iconic large clown head as an entrance and very old school rides. The park only opens on certain days and for certain weekdays, they only open at night because it's a lot spookier and more fun (as you can see above!). 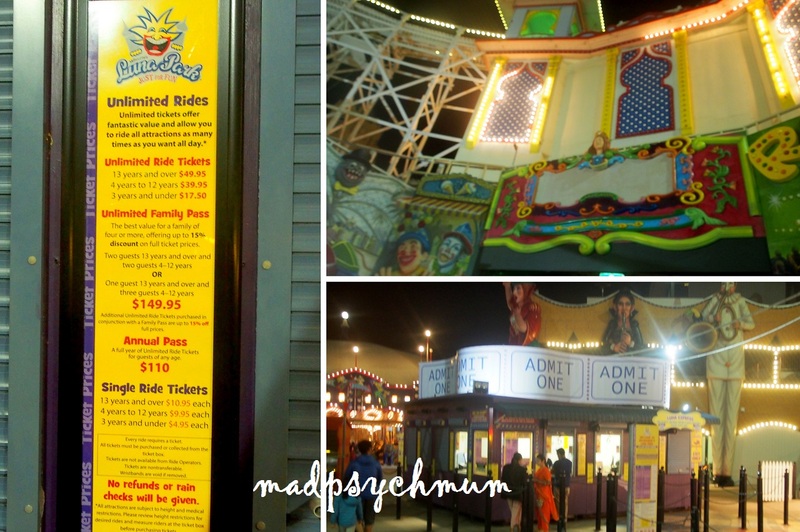 The nice thing about Luna Park is that you only pay if you want to sit the rides. Entry and phototaking is FREE! If you're getting tickets, they are a lot cheaper online so do purchase them beforehand. It costs AUD 49.95 (adult) and AUD 39.95 (child) for unlimited rides. You can also pay for single rides. Ghost train, which looks extra spooky at night! 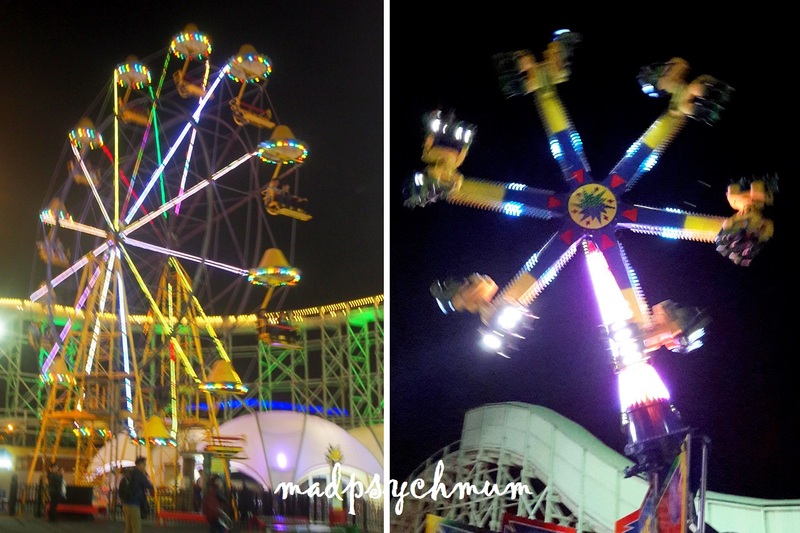 Ferris wheel and a super spinner that I wouldn't be caught dead on!